These carrot bacon breakfast fritters are a delicious and unique breakfast! They’re paleo, whole30, and easy to make egg-free and AIP. When transitioning to a grain free diet, one of the most challenging meals to replace is breakfast! We’re all so used to grain and sugar heavy breakfasts like cereal, oatmeal, toasts, and so forth. It gets even harder when you’re egg-free on top of that. Sure, breakfast hashes are great, but it gets a little old after a while. Sometimes you just want something fun and different. 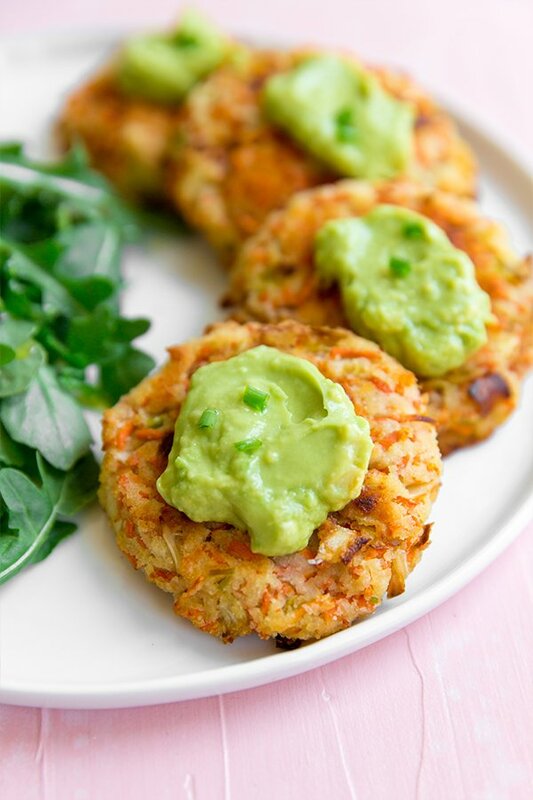 These carrot bacon breakfast fritters are a fun, simple and filling grain free breakfast. They’re paleo, whole30, and can even be made to be egg free and AIP. I’m a big fan of egg free breakfasts and this may become one of my new favorites. These fitters are lightly crispy on the outside, and soft on the inside which makes them perfect in my book. 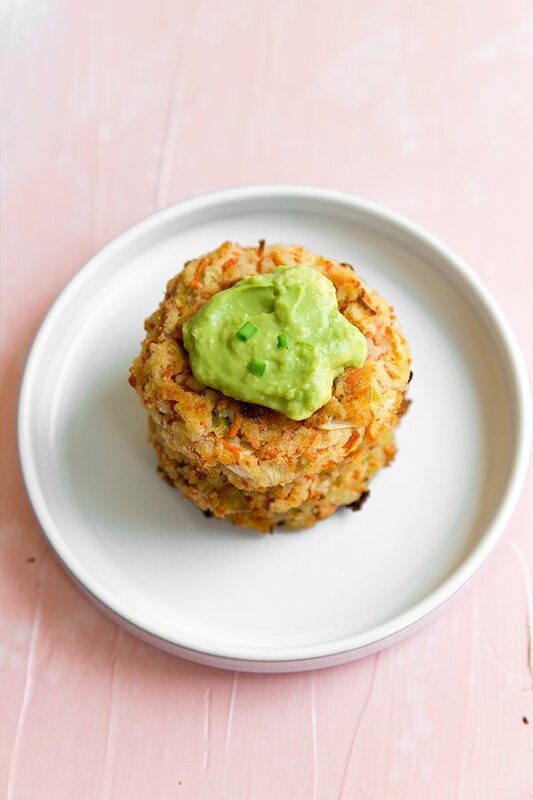 They’re packed with vegetables, a smoky bacon flavor, and can be eaten by themselves or with a creamy avocado mayo for some more healthy fats and flavor. Yes, please! I like getting pre-shredded carrots and just giving them a quick whirl in the food processor to get them a bit finer, but you can also use whole carrots in a food processor to shred them, or even a grater. Bacon adds some fat and protein to these fritters, and a smoky delicious flavor. You’ll want to use slightly undercooked bacon for this recipe as it will cook further in the fritters. Leeks have a similar flavor to onions but are a bit milder. They help to mix it up a bit from always using onions in everything and add some new nutrient profiles as well. Fresh garlic also adds a nice flavor to the fritters. These act as binders in the recipe to hold the fritters together. Coconut flour helps to absorb some excess moisture, so I haven’t tried swapping it for other flours. 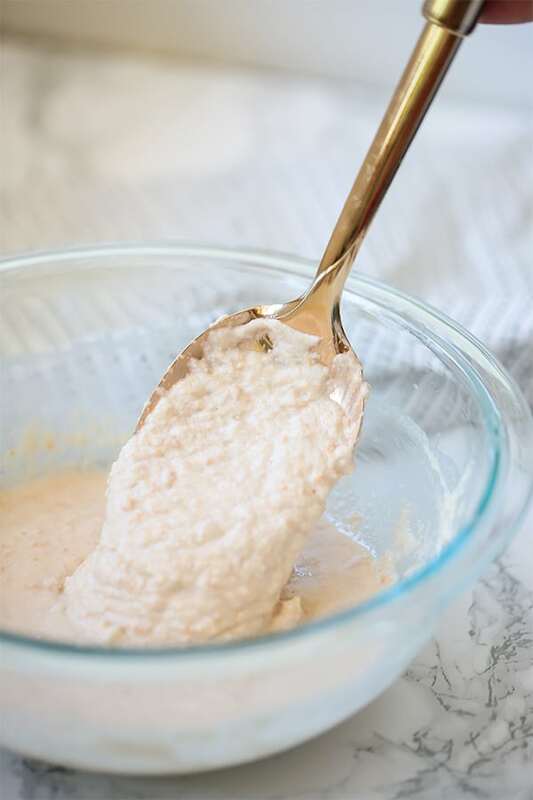 As for the arrowroot starch, you can likely swap tapioca starch in its place if you don’t have arrowroot on hand. Avocado oil can be swapped out for other fats like coconut oil in this recipe. If you’re egg-free like me, you can use gelatin eggs for this recipe. Preheat the oven to 400 F and line a baking sheet with parchment paper lightly greased with oil. Using a large bowl, combine all of the dry ingredients and mix well. Fold in the avocado oil and eggs (or gelatin egg substitute) and mix until a slightly wet dough forms. Bake in the preheated oven for 25-30 minutes, carefully flipping halfway through. Remove from the oven and allow to cool before serving. Note that if you use a gelatin egg, the fritters have to cool longer to allow the gelatin egg to set. For the gelatin egg substitute – Add the water to a small sauce pot and slowly sprinkle in the gelatin. Use a fork to gently mix in any clumps. Set aside and allow the mixture to harden for 2-3 minutes. Place the pot on the stove and turn the heat on low heat. Slowly melt the gelatin over 1-2 minutes. Immediately remove from heat once the gelatin has melted and the mixture has returned to liquid. Vigorously whisk the liquid until it becomes frothy. 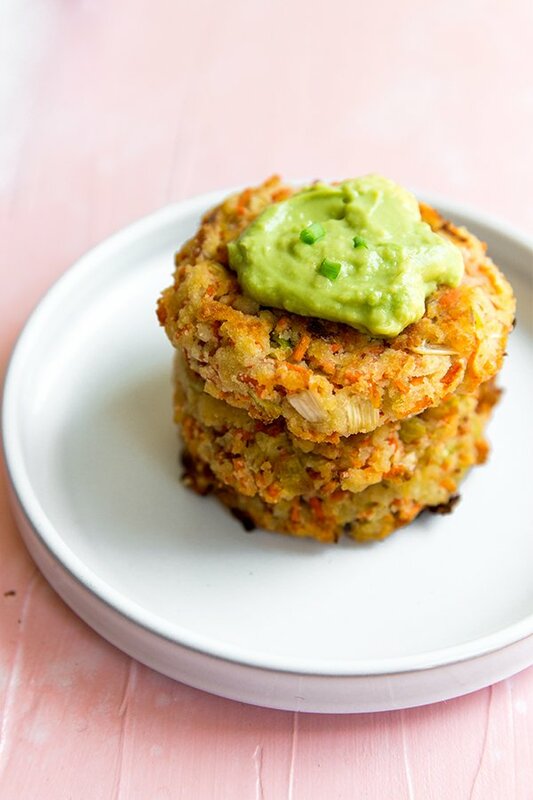 Pour in the crab cake mixture immediately to swap for an egg. This turkey & sweet potato breakfast hash is an amazing egg free breakfast! 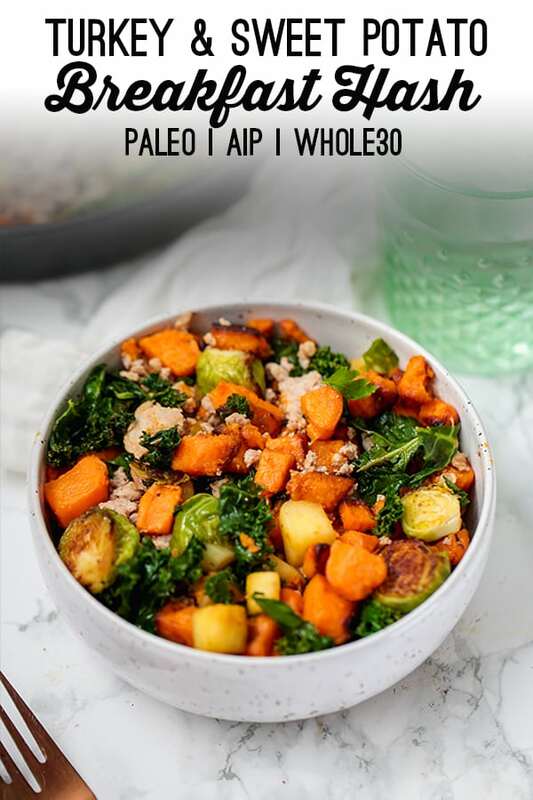 It’s packed with veggies, protein, healthy fat, and is simple to make in one pan. It’s paleo, whole30 compliant, and AIP. Egg free breakfasts can be hard! I get a ton of questions asking how in the world you can sustain a healthy diet without eggs for breakfast. Honestly, I thought that exact same thing for years. I love eggs, and I never wanted to live without them. However, after coming to terms with the reality that I was sensitive to them, I had to figure out what in the world I was going to do without eggs! Eggs are actually one of the most common food allergies, so egg free breakfasts are far more necessary than I initially realized. Egg allergies are incredibly common, especially among young children, and many with autoimmune disease find them to be inflammatory. Regardless of whether or not you’re actually sensitive to eggs, mixing it up and taking a break from eggs every once is a while is always a good idea! This breakfast hash egg free, and is a serious breakfast of champions! Move over cold cereal and skim milk, step aside oatmeal, and don’t even bother applying, breakfast pastries. This breakfast hash is loaded with everything you need for a healthy breakfast, and to start your day off with a bang. 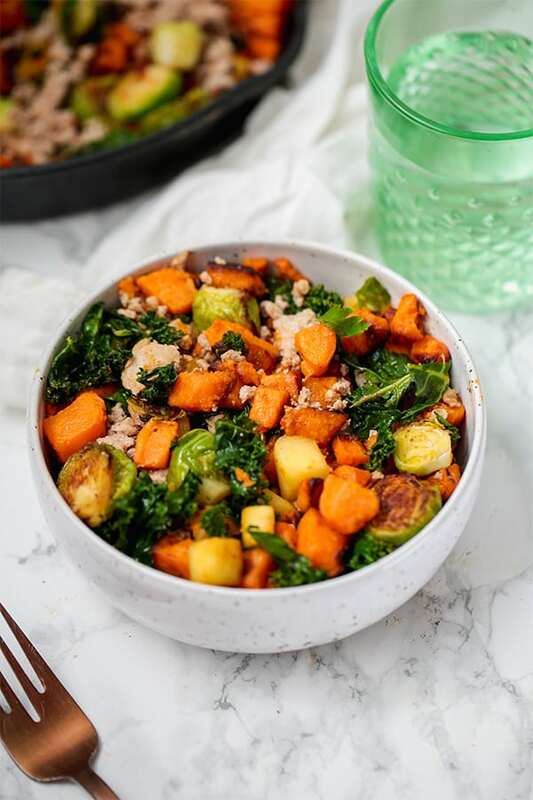 This sweet potato & turkey breakfast hash is made with three different kinds of vegetables, and protein-packed ground turkey to start the day off right! No sugar bombs, no processed carbs, and no nutrient poor breakfasts here. Along with sweet potato, the hash is also made with apple, which adds a bit of natural sweetness and really ties the flavors together. If you’re trying to transition away from sweeter breakfasts to more savory, nutrient dense dishes, this is an awesome stepping stone. Plus, it’s easily made in one pan, which makes for easy cleanup and much less fuss. Yes, please! It’s great for batch cooking at the start of the week for easy breakfasts in a pinch, or make on a lazy weekend. Turkey makes for a great breakfast protein. It’s really neutral, and filling! However, you can use other proteins like ground chicken or ground pork in this recipe. I used orange sweet potato, but you can use other varieties as well. Apple adds just a bit of sweetness to the hash without being overwhelming. I used pink lady apples, but granny smith or gala would work here as well. They may be an acquired taste for some, but they’re super nutrient dense! You can swap the kale for spinach if that’s more your scene. This sweet potato & turkey breakfast hash is a filling and delicious option for breakfast! Using a large cast iron skillet, or a pan, cook the ground turkey on medium heat until cooked through, lightly seasoning with some of the seasonings (reserve the majority for later). Set aside, reserving some of the fat in the pan. Add in the coconut/avocado oil and saute the sweet potato for 5 minutes, before adding in the brussels sprouts. Saute for another 15 minutes until the veggies have softened and crisped to liking. Add in the diced apple and kale and saute for another 4-5 minutes or until slightly softened. Reincorporate the ground turkey, and add the remainder of the seasonings. Stir until fully combined, and season further to taste. Exact cooking times of the vegetables vary depending on size. 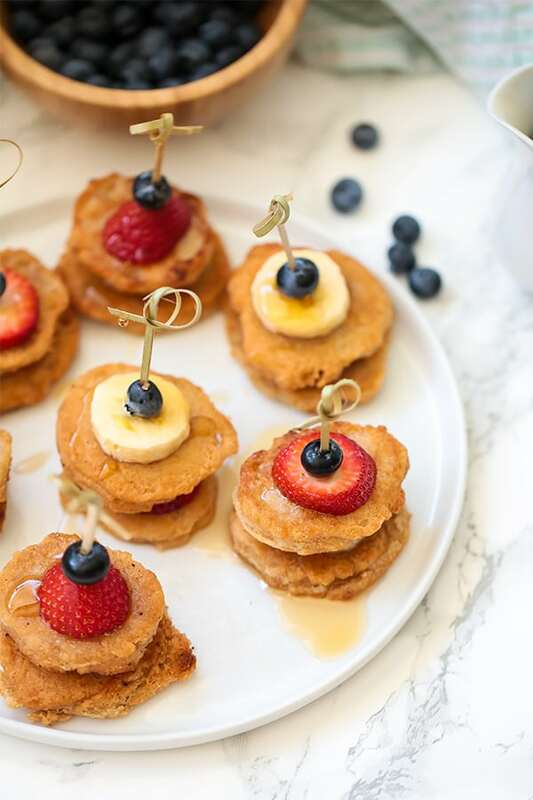 These paleo pancake skewers are the perfect thing to serve at brunch! They’re gluten free, grain free, egg free and vegan. Nothing says brunch quite like pancakes. Pancakes have been present at pretty much every holiday in my house growing up, and most Sunday mornings. There’s little you can do to make pancakes better than they already are… expect for make them into snackable little skewers!! Of course, I love the nostalgia of sitting down to a nice personal stack of pancakes on my plate at breakfast. 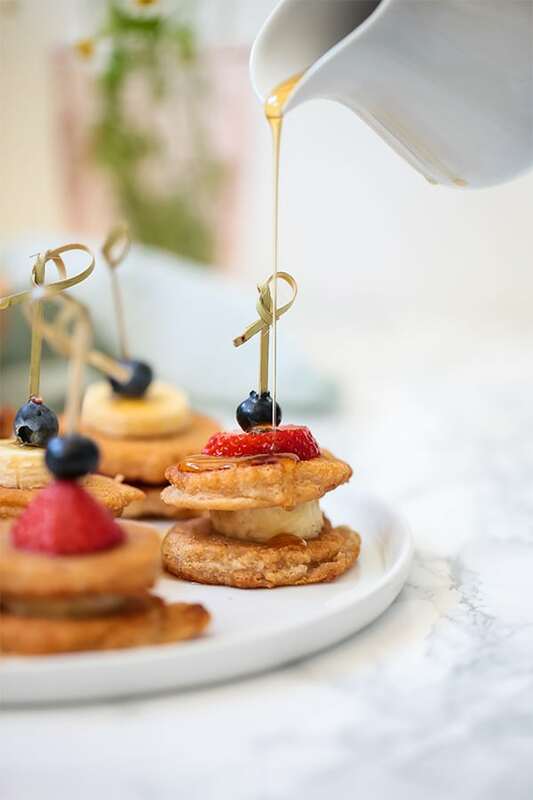 However, if you’re trying to serve a large group at brunch, pancakes can take up a lot of space and a ton of plates and flatware! It’s hard to really enjoy pancakes if you’re milling around and talking to party guests at a brunch. That’s why brunch items like pastries and bagels that are more grab and go are much more popular at brunches. 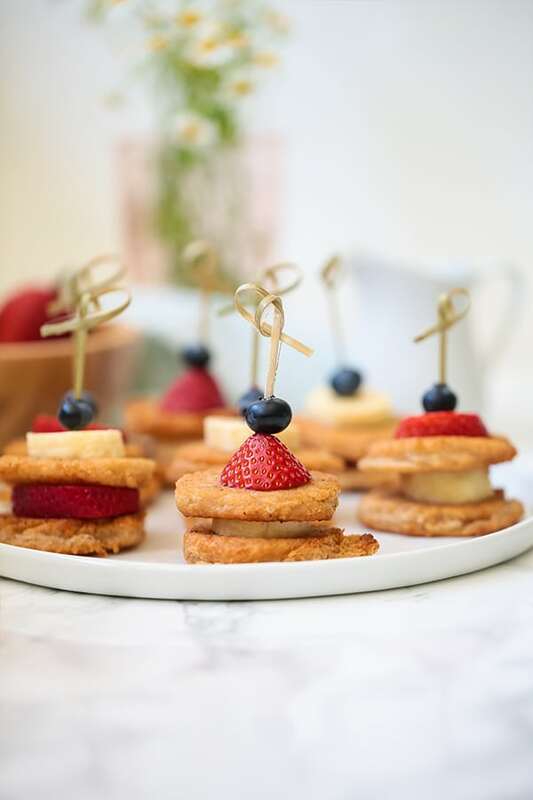 Making mini pancakes and placing them on toothpicks solves that problem of pancakes taking up too much room. They come with all of the pancake nostalgia you love, plus they’re way cuter than bagels! My husband and I actually had a brunch wedding, and I wish we would have had these! But I think we can all agree that they’re perfection for mothers day brunch. I tried tons of nut free options for these pancakes, but almond flour no doubt works the best. This flour makes the pancakes a bit more fluffy. Almond milk is thin enough to keep the pancake batter from getting too thick, which is what you want with good pancake batter. It will be thin, but not runny! This is the egg substitute in the pancakes that help bind them while also making them that much more rich and creamy. These are the fruits that I used, but you can also use other berries like blackberries or raspberries. Can You Make these Nut Free and AIP? Unfortunately, not with this particular. I went through 5-6 different failed variations and nearly an entire bag of tigernut flour trying to make these AIP and it just wasn’t flying. This recipe is a take on my original paleo and egg free pancakes, just reimagined into a fun shape! My main priority as a recipe developer is to give you amazing recipes that you won’t believe are grain free, and healing. I had a vision for what I wanted with pancakes and it just wasn’t working without almond flour and almond milk. However, there are plenty of other AIP and nut free pancake recipes (like this) out there that I’m sure you can apply the same principle to! Plus, almond are the only AIP reintro in these pancakes. They’re still grain free and egg free. And trust me… I’m determined to eventually make AIP pancakes work for me! Add in the almond butter and maple syrup, ensuring that the almond butter is creamy. Pour in the almond milk and stir well. The batter should be thinner but not overly runny. Using a large skillet (preferably cast iron or something that will not stick… this batter is very sticky) melt a tbsp of coconut oil on medium-low heat. Using a TBSP measure, scoop one table spoon of batter at a time into the skillet, frying only 3 pancakes at a time. Fry on low heat until the edges begin to cook, and carefully flip the pancakes to finish cooking. Remove the cooked pancakes and set aside. Repeat the process until batter is finished and add more coconut oil as needed. To assemble the skewers, layer one pancake, one piece of fruit, one pancake and finish with more fruit. You’ll have two-three pieces of fruit, and two pancakes per toothpick, and will have enough for 10-12 toothpicks. Top with extra maple syrup if desired and serve! Eggs are such a staple for breakfasts, and were probably one of the only real foods that I ate as a kid. Who doesn’t love scrambled eggs for breakfast or a hard boiled egg for a quick snack? They’re easy, convenient, and nutrient dense… but so many people (myself included) have egg sensitivities and allergies! The question arises “what are you supposed to eat for breakfast if you’re egg free?!”. Breakfast is one of the hardest meals if you’re egg free, on the autoimmune protocol or just egg free on a paleo or Whole30 type diet. So I’m adding to my egg free breakfast recipes with this Mexican Breakfast Skillet! It’s Paleo, AIP, Whole30, and the perfect egg free breakfast. When I announced that I was doing a Whole30 (I’m on day 6 right now!!) during February/March, I was asked “why the heck do you need a Whole30 if you’re already Paleo and mostly AIP?”. Main answer… treats! There are tons of recipes for AIP treats (I have plenty of my own!) and I was really feeling like I needed a break. 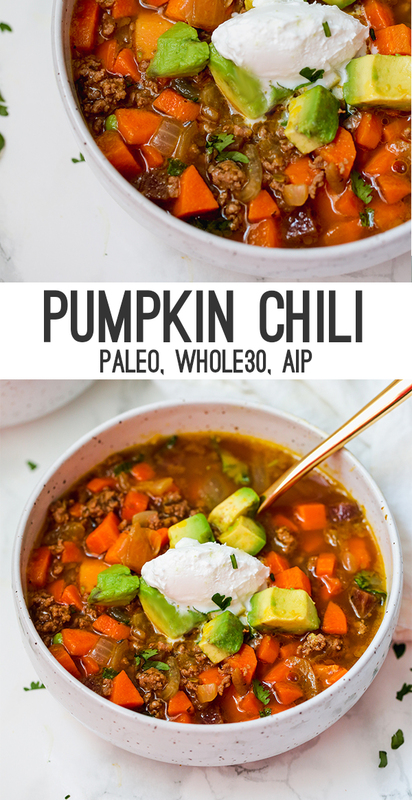 My second reason was to show you guys how you can do Whole30 mostly AIP! No eggs, no nuts, no nightshades, and no premade bars. So an egg free breakfast dish was one of my top priorities to share with you! This Mexican Breakfast Skillet is such an amazing and balanced breakfast. 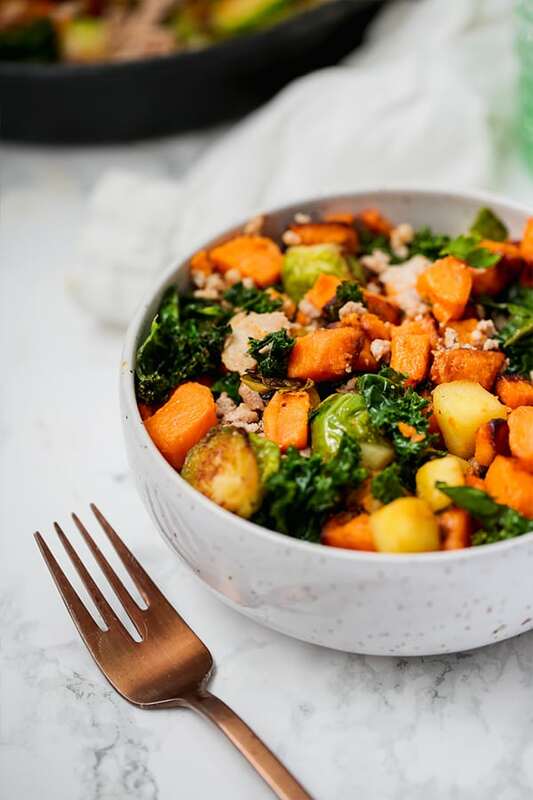 It feature green veggies, a starchy veggie, healthy protein, and healthy fat, to keep you satiated throughout the day, and much less likely to experience blood sugar spikes and dips. 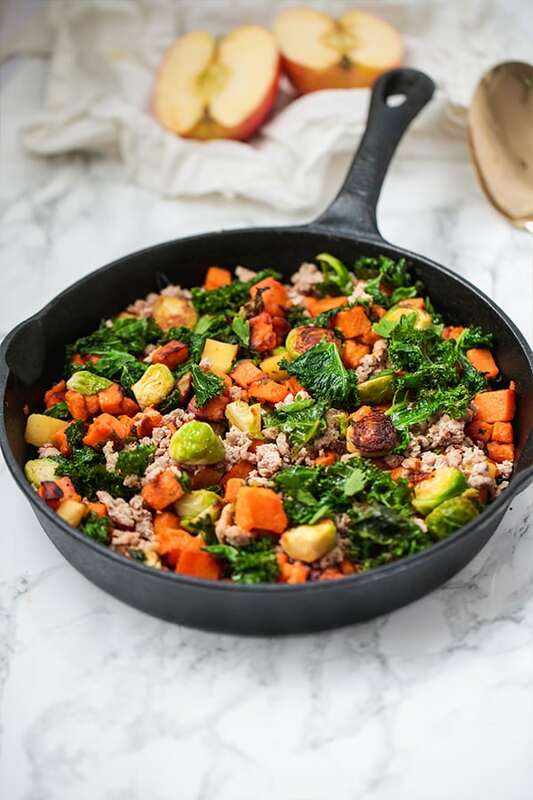 Grass fed ground beef was my protein of choice for this skillet, but you can also use something like turkey, chicken or even a compliant chorizo… I just think beef provides the best flavor here! The starchy veggie of choice in this skillet. 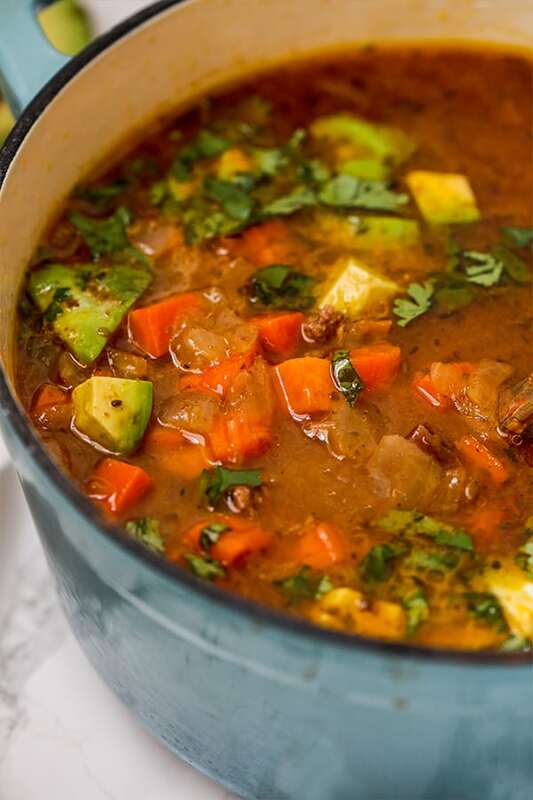 These veggies add nutrient density, and tons of flavor to the dish. What would a taco skillet be without avocado?? As this dish is AIP, it’s nightshade free and egg free. However, if you can tolerate salsa and eggs, go for it! Add the ground beef to the pan and lightly salt. Cook on medium heat until browned, and set aside, reserving most of the fat in the pan to cook the vegetables. Eat as a breakfast skillet, or lunch leftovers! I hope you like this tasty taco skillet! Be sure to tag me on Instagram or share a photo on Pinterest if you try it! Oatmeal used to be one of my staple foods in my teens, and in college. I would eat it at breakfast, lunch and dinner, and would go crazy with toppings! Peanut butter, chocolate chips, jam, blueberries, you name it. I was an oatmeal junkie through and through. When I first started transitioning to a grain free lifestyle to get my gut healed, I thought “well… all grains but oatmeal!”. But, when I started to realize how much oatmeal really was setting me off, I had to call it quits and go for other breakfast options like my breakfast poppers, and carrot hash. However, that doesn’t mean that oatmeal inspired dishes are out the window! This grain free cauliflower “oatmeal” is my answer to being able to enjoy oatmeal again for those of us who are grain free! This cauliflower oatmeal has the look and consistency of oatmeal, but with far more nutrients than traditional oatmeal. Not only does it elevate the nutrient density of your breakfast with cauliflower, but it also has gut healing collagen, and is much lower in sugar than your average breakfasts. Cauliflower can be riced in your food processor, of you can by it already riced. I get mine from Whole Foods, and have gotten it at Trader Joes and Sprouts. It’s a nice short cut! Apple adds a touch of sweetness to the oatmeal! This helps add more body to the oatmeal. I do not have a coconut free version of this particular recipe. This is for liquid, and extra healthy fats. This adds more gut healing nutrients, and protein. I use Vital Proteins, but you can use Great Lakes as well. This cauliflower “oatmeal” is actually a preview recipe new program, Gut Health Overhaul. 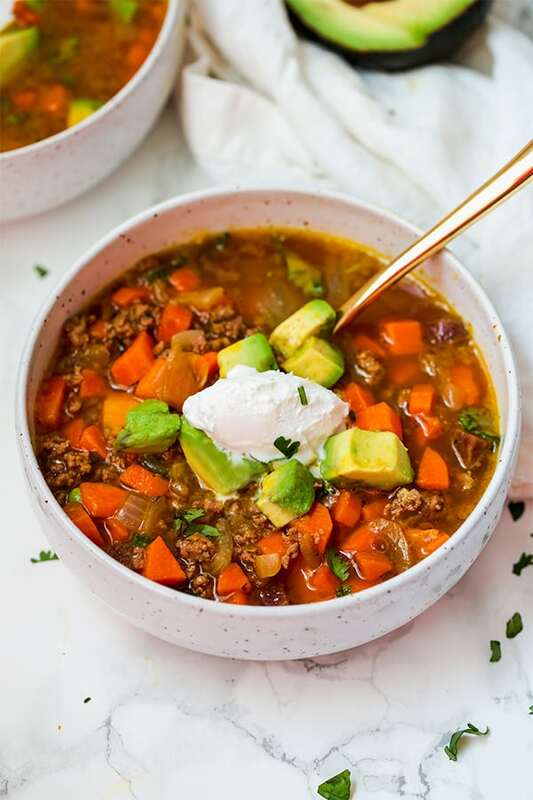 Though it’s much more than just food, this is one of my favorite recipes in the cookbook within the program!! There is also an option to work one on one with me, and this is my only nutrition coaching opportunity available right now. This cauliflower oatmeal is so nourishing and delicious, and looks exactly like the real thing! 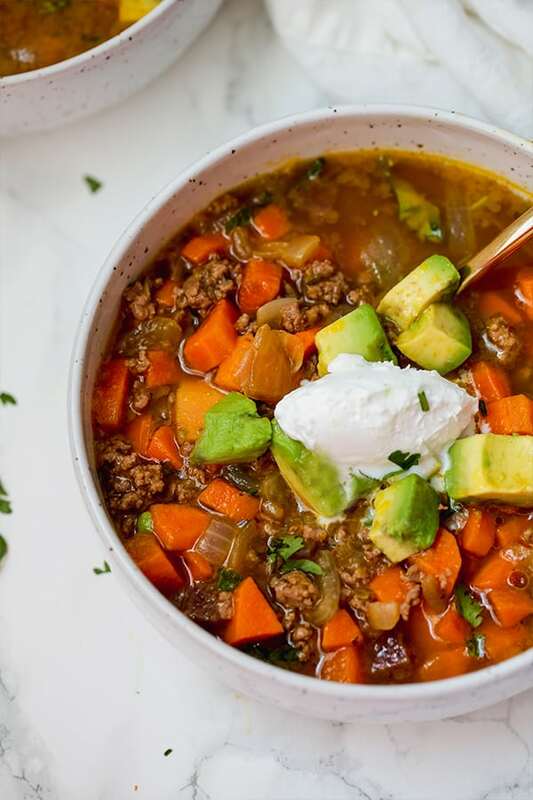 I hope you love this preview recipe from the program as much as I do! Enjoy!